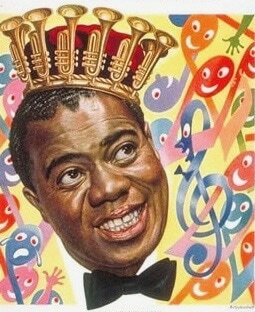 The “World’s Jazz Ambassador,” “King of Jazz,” and my idol, Louis Armstrong, was coming to the Eastern States Exposition in Springfield, Massachusetts. As a dedicated jazz buff and a Dixieland musician, I was ecstatic! Working at a Springfield/Holyoke Radio-TV station, I wondered if I could get “Pops” to appear on our afternoon live TV program. I contacted his Manager, Doc Pugh, and it was arranged. I was to pick him up at his out-of-the-way Springfield hotel and chauffeur him to and from the interview on WHYN-TV. The station, located in Holyoke on a wooded bank of the Connecticut River, was a small structure in the style of a traditional ’50s broadcast outlet. Louis was enchanted with the setting. The TV interview went delightfully and Pops even parodied playing a tune as a shadow behind a scrim, as legal restrictions prohibited a “live” performance. Relaxed and easy to chat with, Pops recalled many captivating first-hand memories of personalities and music of the early days of jazz. A tribute to his following was expressed by the exceptional listener response to his historic ramblings after the show. Flash forward to 1955. A group of friends went on up to the Old Orchard Beach Pier (Maine) to hear Louis and his band. As we stood around the Casino stage at the end of the show, I called out “How’re ya doin’ Pops?” Louis turned around, spotted me and said in his gravelly voice, “Man, it’s that cat from Springfield. Come on up here, gate!” and took my wife-to-be and me to his dressing room to chat like old, long-lost pals. That was ’55—five years after our first meeting. Amazing! Aside from his musical brilliance, natural charm, enthusiasm for life, the genius of this man transcends time, international boundaries and all ages. How often in a lifetime does one have the opportunity and rare pleasure of socializing with true “royalty”?